Let’s Break Down The Plastic Bag Use Numbers in the U.S. It seems like disposable plastic bags are everywhere. Even with the growth of the bag ban movement, there are still single-use bags balled up under people’s kitchen sinks, stuck in shrubs and trees and floating in rivers, lakes and oceans. The amount of plastic bags unleashed each year, and the impact of this plastic, is staggering. On average, an American family takes home 1,500 plastic bags each year. That is a lot of plastic. 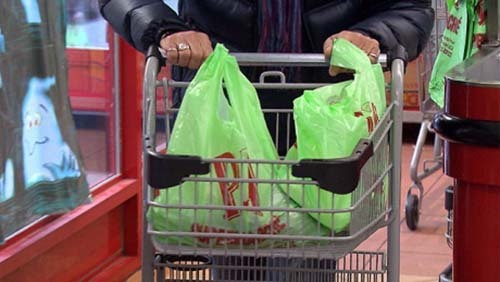 Most of these bags come from grocery, convenience and other retail stores. Plastic bags are in fact recyclable; however, less than 5 percent of disposable plastic bags are recycled in the U.S. This low number is likely to be a result of a lack of education and outreach around the recyclability, in addition to the difficulty of recycling thin plastic bags. Not all recycling organizations accept plastic bags, so it is not always easy for consumers to know where to bring their bags. Many large grocery stores collect plastic bags for recycling, but most curbside recycling programs do not accept plastic bags. What Happens to Plastic Bags After You Get Them Home? The vast majority of plastic bags end up tossed in the trash with Americans throwing away about 1 billion single-use plastic bags each year. This is a problem because when plastic bags are thrown away, they are susceptible to being picked up by the wind, due to the lightweight construction, and carried off where they will be set down in trees, plants, neighborhoods or waterways and become litter. When plastic bags make the transition to litter they pose a major health risk to animals that can either mistake the bags as food and ingest them, or become tangled and stuck in the bags and are left unable to fend for themselves. If plastic bags make the trip to the landfill they still represent a problem, because they do not safely breakdown. Over time the plastic will break apart into smaller and smaller pieces of plastic and eventually these tiny pieces will leach chemicals into the soil. All of these numbers add up to a lot of plastic, and most of it is not handled in an environmentally responsible manner. It is mostly likely that disposable plastic bags will end up as litter or in a landfill and neither of these options is ideal. Recycling of single-use plastic bags could offer a viable solution, but such an embarrassingly low percentage of plastic bags are actually recycled. Does your business want to be a part of the solution? Get started HERE! If a Girl Scout Can Do THIS, What Can YOUR Brand Do? 5 Ways to Show Your Patriotism with Reusable Bags!